Over the course of the season’s 30 races nine different divers stood atop the victory podium – five of them aged under 16 – and there were race wins or top-three finishes for nine different teams running the championship’s FIA-accredited Formula 4 chassis built by French manufacturer Mygale. Drivers from Brazil, the USA and India joined their British counterparts on champagne-spraying duty. The season kicked off in impressive style at Brands Hatch in early April – a more than appropriate venue for the launch of the modern-era successor to Formula Ford, whose genesis was at Brands in 1967. 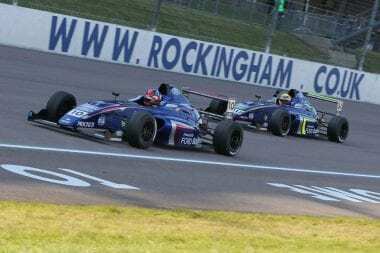 And those first races set the scene for the season to come, with eventual champion Lando Norris, 15, making history as the first ever MSA Formula race winner and going on to take a second Brands Hatch win for the Carlin team in front of ITV4’s feature race live-broadcast cameras. Although Lando announced himself as a contender right from the outset, his progress to the crown was not all plain-sailing. After his Brands Hatch double he followed up with a reverse-grid race win at Thruxton, but did not really hit his stride until June’s Oulton Park rounds, where he topped qualifying for the first time and snatched a win and a second place. Thereafter, Norris was pretty much unstoppable in qualifying – he went on to top the timesheets at Croft, Knockhill, Rockingham and Brands GP. The other drivers to qualify quickest during the season were Dan Baybutt, Dan Ticktum, Sandy Mitchell, Colton Herta and MatheusLeist, and each of them managed it only the once. Norris was quickest five times, and he never qualified lower than second. Qualifying well made the racing all the easier for Norris, of course: he collected a total of eight victories, the last of them – at Brands in October – leaving him needing only a handful of points to secure the dual titles FIA Formula 4 Champion of Great Britain and MSA Formula Champion. Those points were duly gathered up in the second Brands Hatch GP outing, with a race in hand. It was only at that point that Lando’s chief rival for the title, TRS Arden driver Ricky Collard, was prepared to concede defeat. Ricky, with a season of single-seater experience under his belt thanks to a promising rookie year in Formula Ford in 2014, was a great competitor and led the points table for a good chunk of the season thanks to his never-say-die attitude. He took deserved wins at Brands, Oulton, Croft, Knockhill, Rockingham and Silverstone but was never really able to hook it all up in qualifying, and that was a handicap. Crashes in qualifying at Rockingham and pre-race testing at Brands came at exactly the wrong moment for his title hopes. Nonetheless Ricky is a deserving championship runner-up and finished well clear of his closest rival. Norris’s Carlin team-mate Herta came to the championship as its youngest competitor – he was only five days past his 15th birthday at the outset – and the Californian, son of IndyCar racer winner Bryan Herta, took a little time to adapt to the car, the circuits and the country. A second-place finish at Croft in June hinted at good things to come and Colton returned from the summer break a new driver; twin wins followed at Snetterton and then single victories at Rockingham and in the final round at Brands Hatch to secure championship third. Oddly, Colton scored both the narrowest and widest wins of the year, both of them in front of Norris: 0.248s at Rockingham and 7.560s at Brands. Another of the revelations of the season’s second half was 15-year-old Enaam Ahmed, who came into single-seater racing with a great karting pedigree as part of the talented TRS Arden trio. By his own admission he struggled early on, but he worked hard at it and came back at Knockhill in August to claim his first Rookie class victories. The Rookie class championship was pretty much in the pocket of 16-year-old Dan Ticktum until an entirely avoidable crash at Silverstone earned the Fortec driver a track ban; Ahmed stepped up to the plate to take the class three times at the Brands Hatch finale – as well as his maiden outright race victory – and claim the Rookie championship honours. There were several other MSA Formula heroes, not least those who won races: Double R’s talented Brazilian driver Leist, young Scots star and TRS Arden team member Mitchell, JHR Developments’ experienced hand Sennan Fielding and Racing Steps Foundation driver Josh Smith. Then there those who made the lower steps of the podium, such as James Pull, twice a third-place finisher for JTR; Double R’s other Brazilian, Gustavo Myasava; JTR’s Baybutt; SWB Motorsport man Rafael Martins; Indian racer Tarun Reddy for Double R; Richardson Racing’s Louise Richardson and MBM Motorsport man Toby Sowery. There are honourable mentions also for championship regulars Petru Florescu(Carlin), Jack Barlow (MBM), Jack Butel (SWB/JHR), Jessica Hawkins andDarius Karbaley (Falcon); Ollie Pidgley and Greg Holloway (Richardson Racing) and Ameya Vaidyanathan (JTR). In all, it was an inaugural season to remember for MSA Formula, Certified by FIA, Powered by Ford EcoBoost, and one which bodes well for future years and for the career development of Formula 1’s stars of seasons to come.